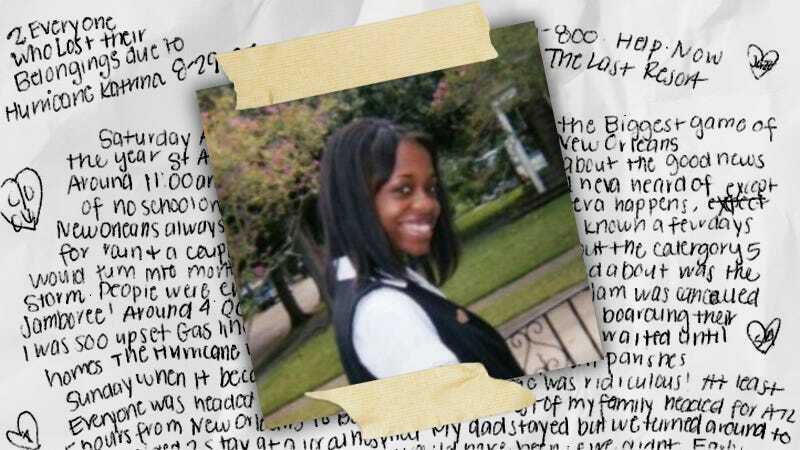 I was 16 years old, a senior in high school, when Katrina devastated New Orleans. Like most teens my age, my biggest concern was what I was wearing to the weekend football game, or who was going to be my prom date. Who knew that when I left my home Saturday afternoon for what I considered a pretty standard hurricane evacuation, I’d never return. I had kept a diary all through high school. But when we evacuated, I made the horrible mistake of leaving it behind. So I decided to start a new one, and this story I’m sharing with you is the first entry, written the weekend of the storm. I’m getting ready for the biggest game of the year, St. Augs Jamboree like most teenagers in New Orleans. Around 11:00 am I get a call from Jazmin telling me about the good news of no school due 2 some hurricane that I neva heard of. New Orleans always gets hurricane warnings but nothing eva happens, except for rain + a couple days out of school. Who would have known a few days would turn into months. As the day went on I heard more about the category 5 storm. People were evacuating the city slowly. All I cared about was the Jamboree! Around 4:00 Saturday I heard the news that the Jam was cancelled. I was soo upset. gas lines were around the corner. People were boarding their homes. The hurricane was headed our way. My family + I waited until Sunday when it became a mandatory evacuation for all parishes. Everyone was headed in different directions. Traffic was ridiculous! At least 5 hours from New Orleans to Baton Rouge. The rest of my family headed for ATL + some decided to stay at a local hospital. My dad stayed but we turned around to get him. Thank God who knows where he would have been if we didn’t. Early Monday morning I found out that my friend Evlisha stayed in her home. I was soo scared the storm was soon approaching. Tuesday I watched CNN all day to see the damage of Katrina. It was worse than what I expected. Homes were flooded, windows from hotels businesses were gone. All I could think about was if my family + friends were OK. Later we got news that the Superdome, which housed 40,000 evacuees roof was leaking. That’s when I knew it was serious. The aftermath of Katrina was even worse, two levees which stop the water broke. New Orleans was now underwater. I really didn’t know what to think. I couldn’t imagine myself with no home, clothes, friends + family. I couldn’t imagine not having a senior year, graduating from Xavier prep. Enjoying my sr year. As I came to reality that everything was gone I couldn’t stop crying. You think it will [not] happen 2 you until it does. Everyday I hear from another person, its hard talking 2 them + hearing them knowing that I can’t see them 4 awhile. I dunno what I’m doing about school or anything right now. All I do + all I can do is pray. It’s a new beginning. Its hard starting ova w/ nothing. I’m goin to miss EVERYTHING. I <3 everyone. I hope everyone is safe. I pray New Orleans will become bigger + better. See everyone in the future. Of all the things I lost in the storm, my diary held the most weight. I never considered myself great at writing, but I’ve always enjoyed documenting my experiences, and I used to tell myself I’d publish my diary some day just for self-reflection. I hadn’t read it in a few years, and, reading it again 10 years after Katrina, I teared up towards the end. It freaks me out to remember that I didn’t have a clue what was next, what was in store. In day to day conversations among fellow New Orleanians, you’ll still always catch somebody saying “before the storm.” We all want to remember how things were prior to. I used to live in a beautiful neighborhood in the heart of Gentilly, also known as the 8th Ward. I had great friends and awesome memories growing up in that house. But it wasn’t too long after this journal entry that I knew I’d never go back. I remember my heart dropping when I saw the news flash an image of an elementary school two blocks away from us. The school was totally submerged. Our house held eight feet of water. It saddens me to say I haven’t been back to my neighborhood, to my house. Someone else lives there now. Hopefully one day I’ll gain the courage to go visit this place that’s so true to my heart. Reading this diary entry, which I wrote in my brother’s apartment in Lake Charles, what comes to mind is not “before the storm” but after. I lived in three different cities that year, went to four different high schools, didn’t attend senior prom and had two high school graduations. My mom drove me back and forth between Baton Rouge and New Orleans every day, for five months, so I could graduate. 40 of my family members lived in one Atlanta townhouse. And somehow, all I can remember is the joy we shared. As long as we had each other, that’s all that mattered. My family moved back to New Orleans eventually, in 2009. It feels great to be able to call NOLA home again. It will never be the same, but I’m back within the joyous spirit of a community that will never give up. Heather Lynn Haynes is a future media mogul and matchmaker, currently working towards that goal at VH1. She loves seafood, fly shoes, hip hop music, and EVERYTHING ABOUT NEW ORLEANS.